This website relates only to that part of Hans Happ’s work, which concerns its figurative mechanical objects. 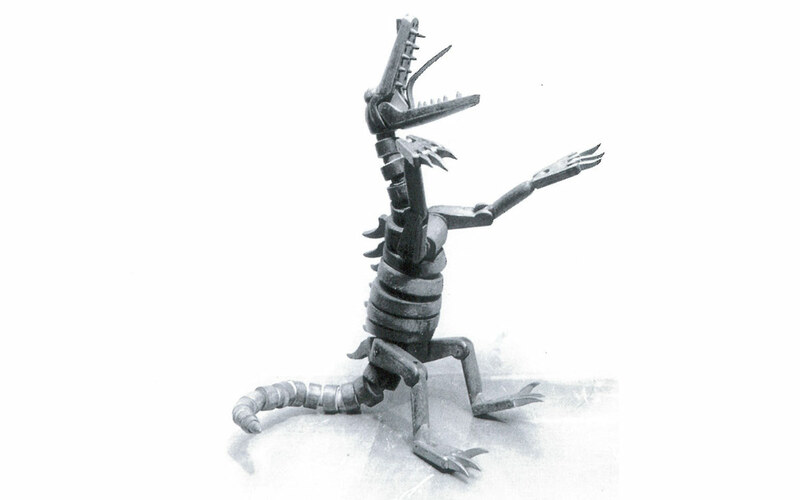 It must have been in the first half of the 1980s when I saw a report of an exhibition of well-designed wooden toys on the Südwestfunk television, which fascinated me immediately because, I had never seen such figurative-mechanical art-toys created before. As I found out later, the exhibits came from the collection of Hans Jürgen Rau, a photographer and designer from Dreieich near Frankfurt. I reached out to this collector, who introduced me to these special exhibits of the neighboring artist Hans Happ. I had seen neither before nor after such brilliant artistic creation in Germany, which was created at this level both artistically and technically. 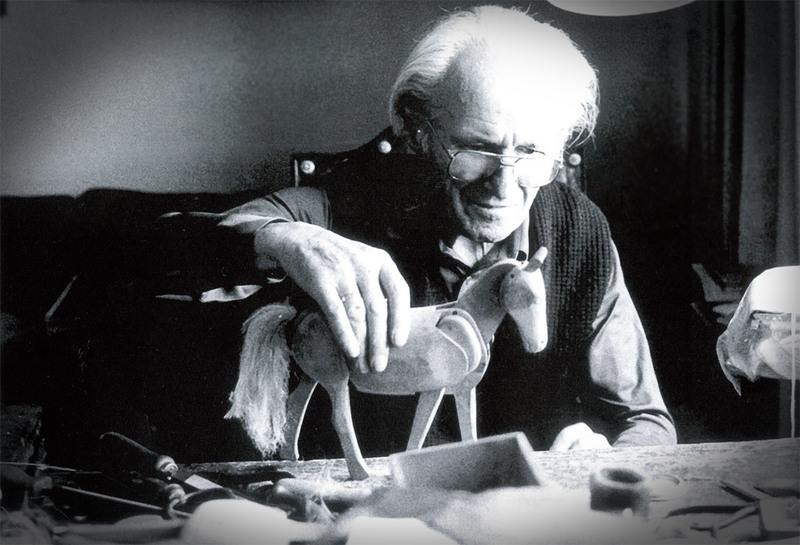 Unfortunately, it is hard to find a trace to the genius toys and mechanical objects of Hans Happ, in the media. That is why, before this artist is completely forgotten, a website especially with video material devoted to him is needed. 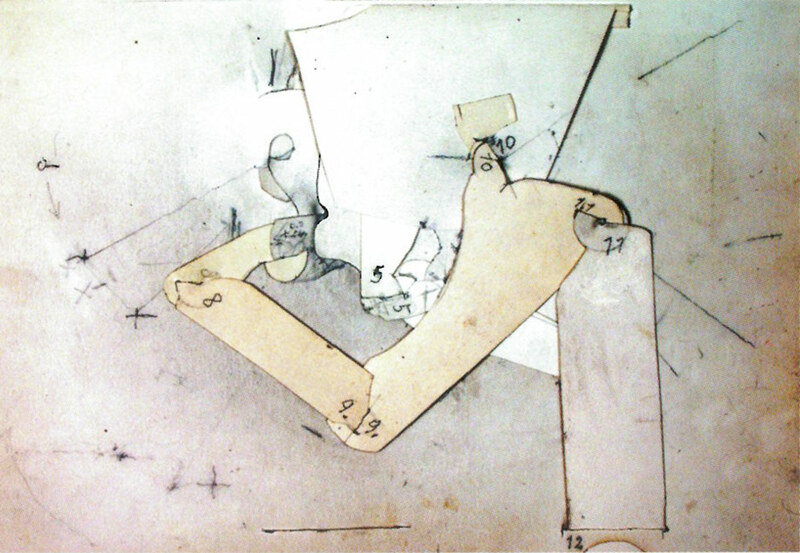 Today it is a mystery… why his work has not led to any television documentation. In the middle of the 80s, I met this artist personally. I had a chance to visit him several times, and he was still working on the objects in such an old age with an unimpeded spirit. It was a tragedy that he had great problems with his shaky hands, which can also be noticed in some of film shots. I think it is the right time to mention that some of his works are included in my book “Mechanische Spielobjekte und Automaten” (Hugendubel, 1987) . 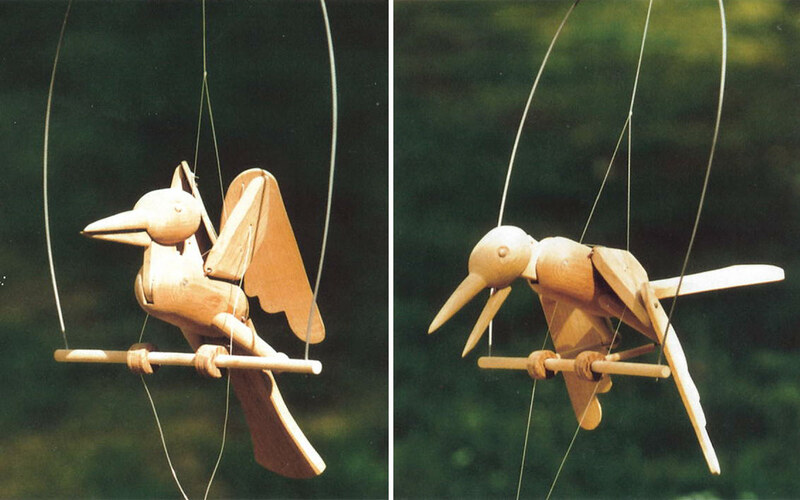 Previously in 1983, H.J.Rau and E. Heinold had a large-format picture book “Wooden toys from all over World” in Weingarten Verlag, which also includes two pieces by Hans Happ. By the way, I see this book currently very cheap in the antiquarian portal Eurobuch.com. 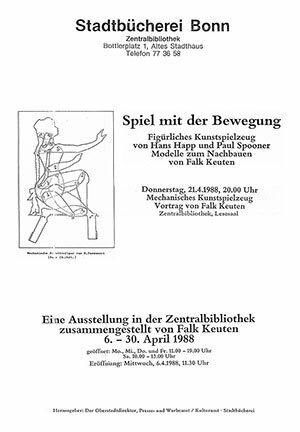 Not so long after my publication, I did an exhibition of works by Hans Happ and Paul Spooner (at that time he was quite unknown) in the central library in Bonn. Here I had the opportunity to get some video recordings of Hans Happ’s objects through my friend Hans Kuhlmann (Bedburg). As far as I know, these are the only video documents preserved until today. 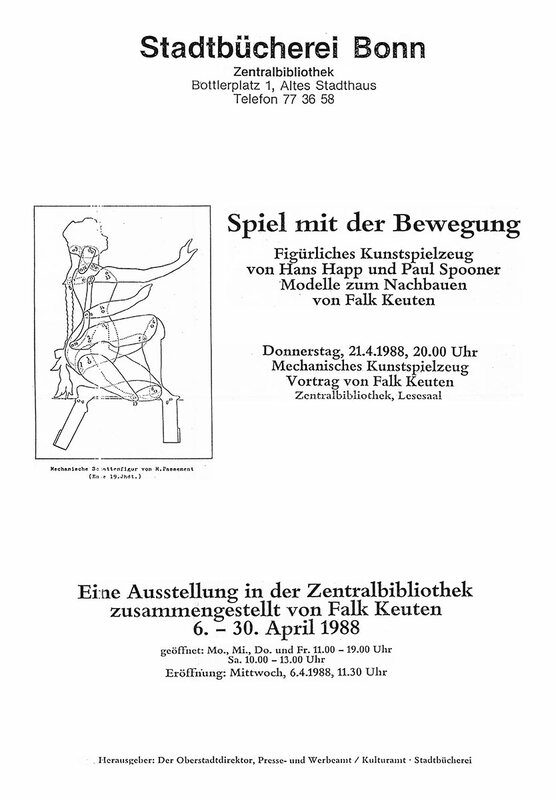 There was a posthumously exhibition “Schlange, Panther, Vogelpferd – Mechanische Spielobjekte by Hans Happ” in the Hessian Puppet Museum, Hanau-Wilhelmsbad, in 2004. There is a 28-page catalog booklet of this exhibition which can be viewed here as a PDF file which provides further information on Vita and the work of Hans Happ. 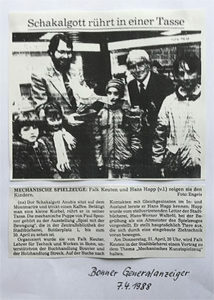 The publisher and curator was the museum director Martin Hoppe. As far as I know, Hans Happ’s inheritance of the mechanical artwork is not held together, which means that there will be no exhibition of this kind in the future. Finally, I would like to thank the artist Yasemin Sayibas Akyuz from Bodrum who built this website. I deliberately limited myself here to the objects shown in the 1988 exhibition in Bonn because they are also cinematically documented. 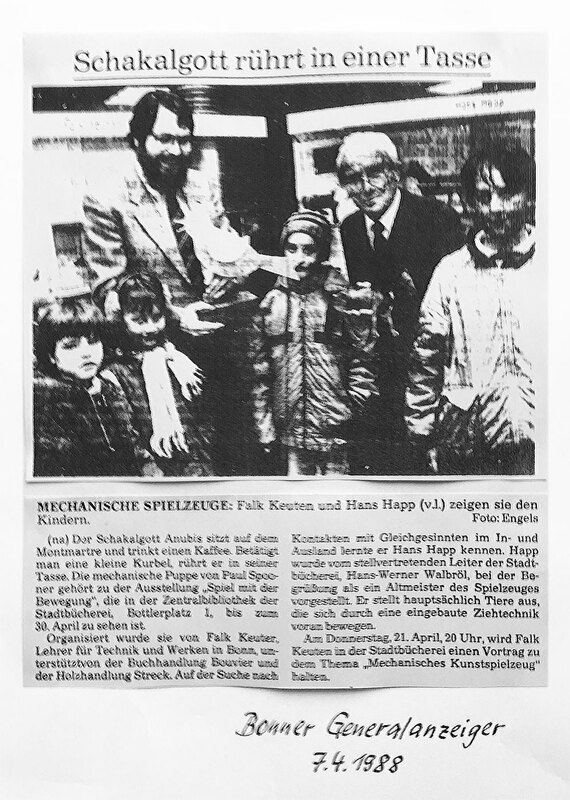 All the rest can be read in the PDF of the Hanau exhibition in 2004. The objects are classified by material type. The cinematographic documentation has been created by digitizing of an old VHS film and refers to two places: Vernissage in the Zentralbibliothek Bonn and demonstration of the models after the exhibition at my home. Vernissage, Poster, Press people direct Hans Happ for a photo. 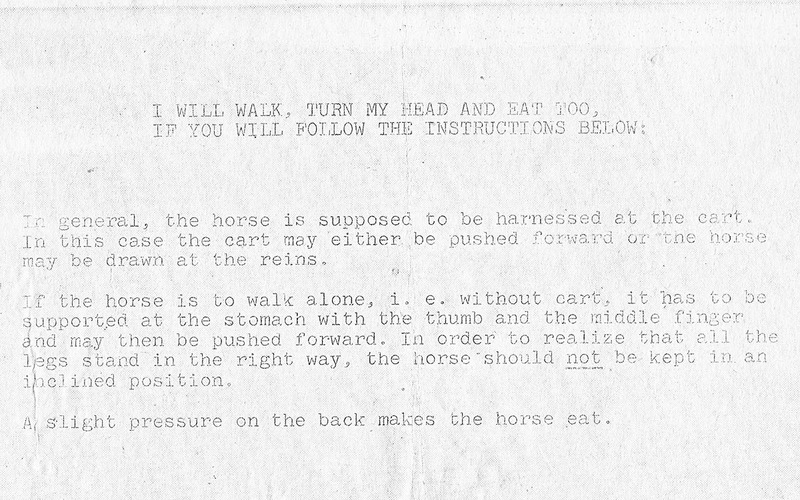 Hans Happ introduces the unique design of horse carriage: drawn on a string, the horse moves in natural motion only by the friction of the hooves on the ground. 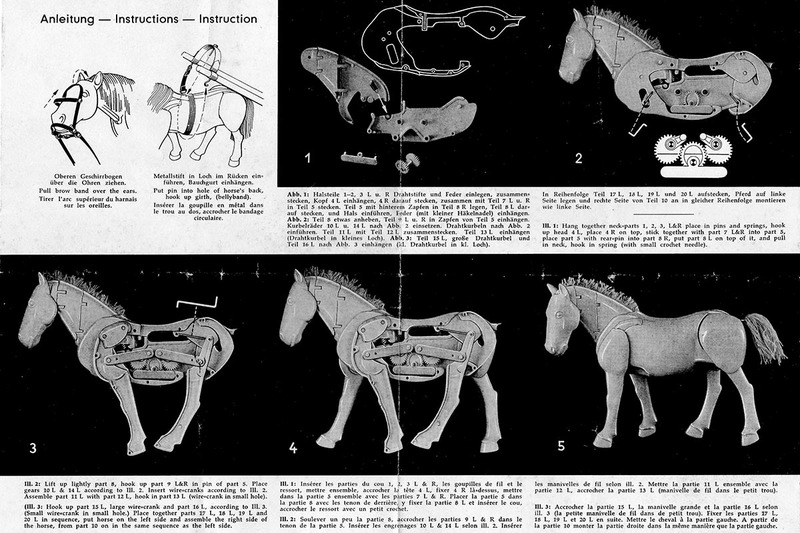 Falk Keuten at home, a forerunner model with coupled movements of single legs, 0.39: first horse running correctly with friction resistance which can even bend its head even under pressure on the back, 1.33: experimental models for the mechanics which always cause only 3 feet on ground, during the 4. foot lifts, 3.11: Hans Happ’s invention of this horse was produced by HAUSER until the 1960s, but was terminated because of mechanical sensitivity. 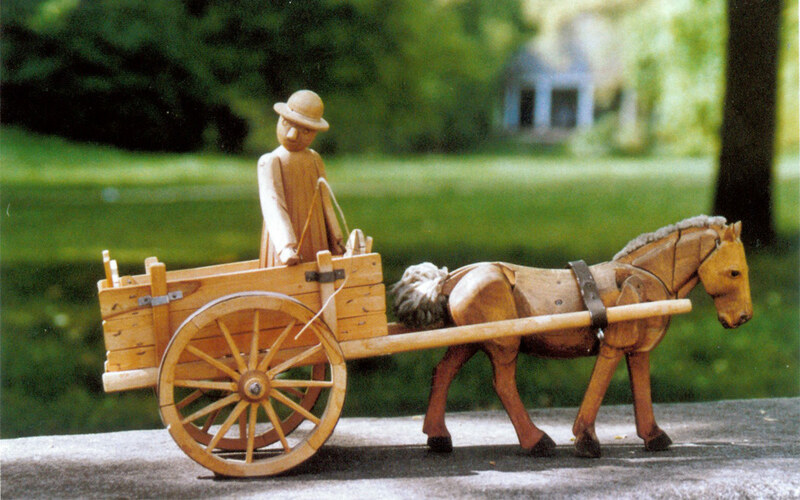 4.30: Horse carriages, carved by Hans Happ in a small series of 10 pieces. Vernissage, automaton, when the correct coin is inserted, the bird moves, it straightens, spreads the wings and pushes its head to the front, opening the beak. Falk Keuten at home, small bird with rigid beak, big bird with moving beak. 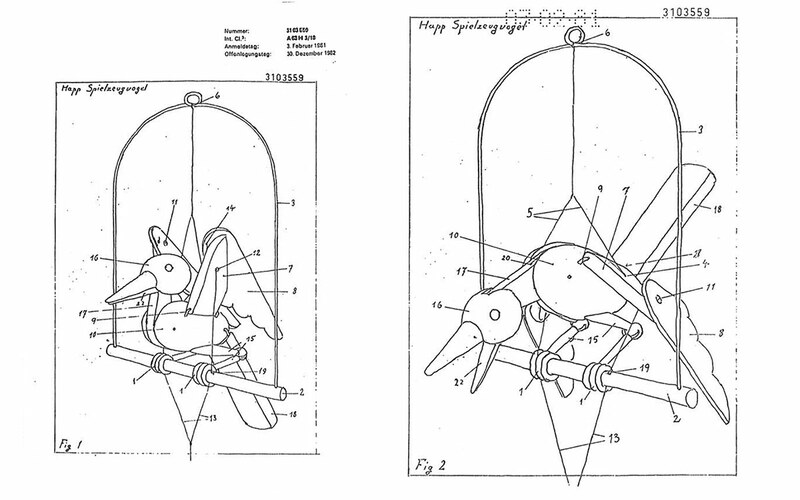 These birds are patented. However, interested producers jumped off again, as they did not find any employees who could handle the difficult knotwork of the nylon threads in the necessary precision. Only one artisan team from Southern Germany could produce a small edition of 50 pieces. 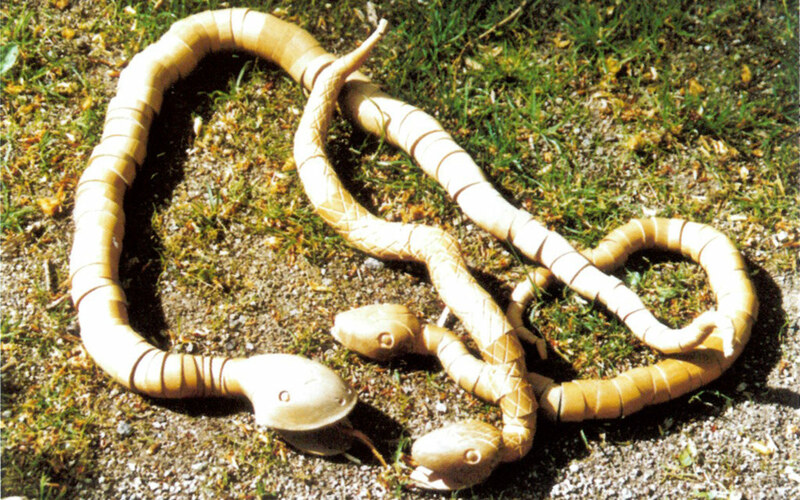 Falk Keuten at home: 0.00: dragon, lion, snake; they are carvings, whose body parts can be held together by elastic bands and twisted together and many form variants are possible. 1.14: the wood-carved panthers and donkeys were highlights of the exhibition. They carry a grinder in the interior as a spinning mill and are driven with their tail cranks. In the panther, the spice flour emerges from the snout over a laterally moving lower jaw. In the donkey the spice spout is also in the muzzle, where the whole head moves. Both pieces are unique artworks! Further information about the plastic horse of the Hausser company you can find in the exhibition catalog “Schlange, Panther, Vogel, Pferd”, Hanau, 2004 (see PDF at the end), on page 20/21. 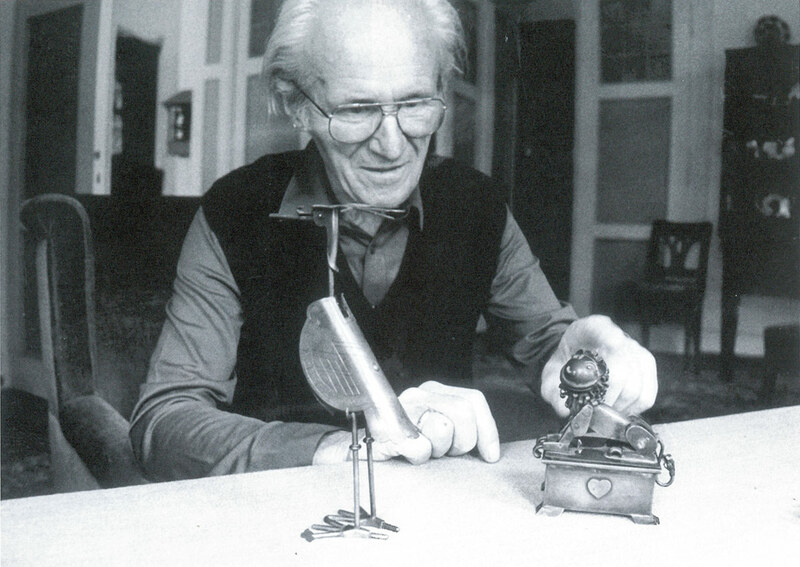 Hans Happ with metal scales and patience-box made of metal (1989). Falk Keuten at home, the metal scales are designed in an elegant crane form whose head forms a platform with beak and springs, for the letters. When the load is applied, the belly side of the body rotates with the scale of a pointer. The box is intended as a check-box for Patience cards, and has a wonderful and playful lock in lion shape(!). The spring-loaded closing mechanism ends in the lion’s head, which holds the box closed with its paws. When someone presses on the head of the lion, he lowers himself and pushes his paws forward and the lion lid can be lifted. What adorable inventions! Both pieces are unicates. 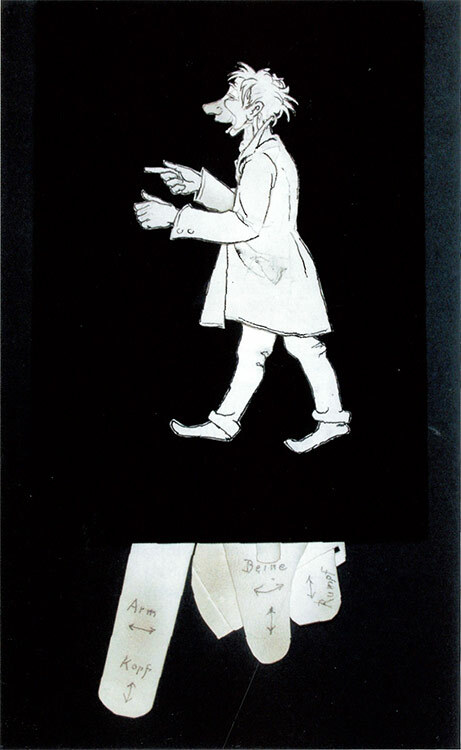 Vernissage, 0.00: Hans Happ introduces “Cavalier with bouquet of flowers”: Scene with closed door, when the door is opened, the cavalier becomes visible as he bends slightly forward, he delivers a bouquet of flowers and enters with one foot. 0.35: Game figure, which can be moved with several pulling strips by a puppeteer. Hans Happ explained his specially invented joint technology that simply done only by hooking into slots. 2.40: Sickbed: The nurse gives a patient a spoonful of medicine. 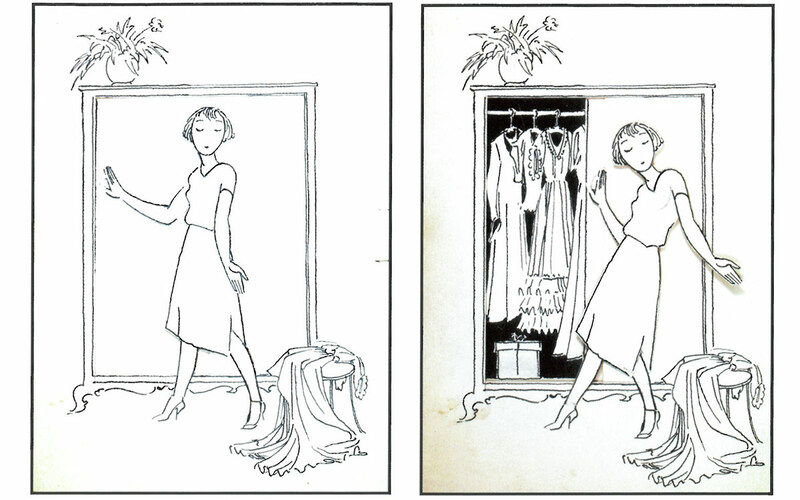 3.20: Miss with wardrobe: opening the sliding door, the lady seems to say proudly, with a charming head: “Look what I have here! 3.50: 1950s advertising card for a dishwashing liquid from SUNLICHT: a housewife immerses a dirty plate in the sink and -a magical moment in the paper mechanics- the plate is now pulled out again cleaned. 4.40: Dumpling-eaters. Hans Happ explained the intricate mechanics inside of the image. 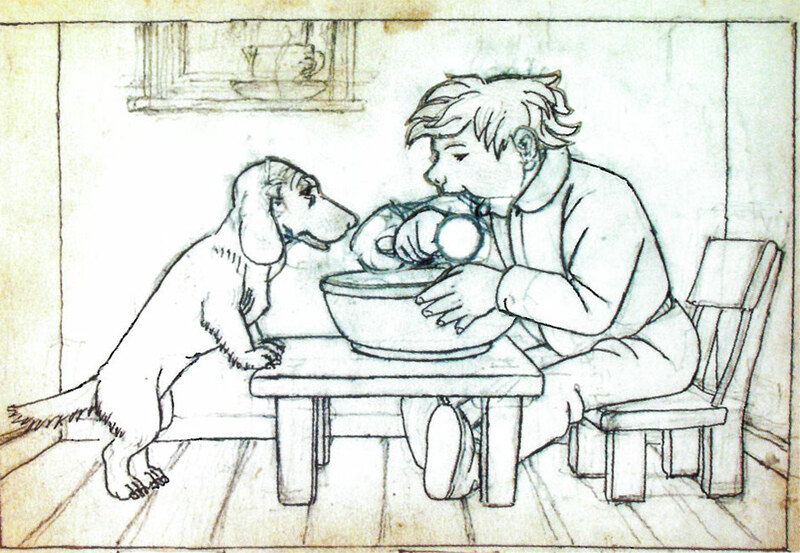 Falk Keuten at home, with the exception of the first figure of the robber the others are described further in the previous chapter. Copyright © 2017, All rights reserved. By Falk Keuten, Bonn, Germany. Blogger of "Spiel und Kunst mit Mechanik II"